I have come further than before… shall I repeat the installation process? Can I install/amend the bootloader only? I can assure you I let cnchi automatically partition the 2TB disk. For now cnchi is at least fetching packages. And I will create a Swap file as soon as the installer stops. At which point does the installer stall? Also, the logs at /var/log/cnchi/cnchi.log is helpful. One note still: the size of your home partition may be too large for some file systems, you might want to try smaller, e.g. 2TB. This time I have used just the 2 TB disk for everything and let the installer cancel the disk and create the partitions. I really hope someone is able to see what’s wrong. I did not choose lembrame this time, but I doubt it was the cause. I am new to Antergos and to this community. 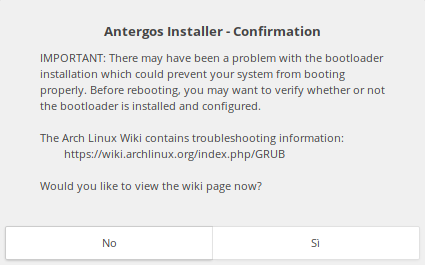 After successfully installing antergos from the live media on my laptop (it was easy being bios+intel+intel onboard graphics+1hdd), I wanted to use the same media on a PC , but I am unable to complete the installation process. This machine (UEFI+AMD with Radeon PCI graphics +2TB sata HDD+3TB SATA HDD) is giving me problems. But I am still unable to complete the installation. I thought the issue can be with the manual partitioning. I would like to use the disks, also with LVM if better and I am open to other suggestions.